Egyptian court sentences former advisor to toppled president and 13 other people to life in prison for belonging to an illegal group. An Egyptian court on Thursday sentenced a former advisor to toppled president Mohammed Morsi, along with 13 other people, to life in prison for belonging to an illegal group, AFP reported. Abdullah Shehata was an economic advisor to the Muslim Brotherhood-affiliated president, who was democratically elected in 2012 following the overthrow of longtime former President Hosni Mubarak. 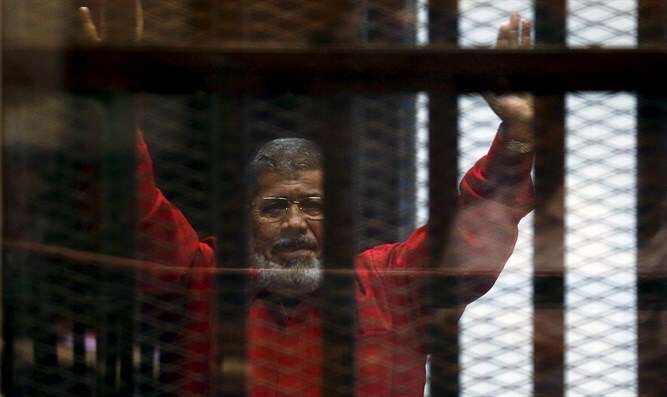 Morsi was ousted by the army in 2013 amid mass protests against his rule. Shehata and the 13 others sentenced to life terms were accused of weapons possession, belonging to an illegal group and "violating citizens´ freedoms", according to AFP. The prosecution accused them of creating "special cells" to receive training in how to make sound bombs, the state-run newspaper Al-Ahram reported. They were planning to cause "a state of instability in the country" by targeting essential infrastructure, including electrical transformers, it said. Six other people were sentenced to 15 years in prison and another to 10 years over the same case, according to state television. Egypt has intensified a long-running crackdown on dissent since President Abdel-Fattah Al-Sisi's re-election in March. Morsi himself has been sentenced to decades in prison in several cases, including one alleging he used unauthorized violence, arrest and torture to put down a protest outside the presidential palace, and another based on his leadership position in the now-banned Muslim Brotherhood group. Other cases are still pending.